482 sq.ft. – 2,200 sq.ft. 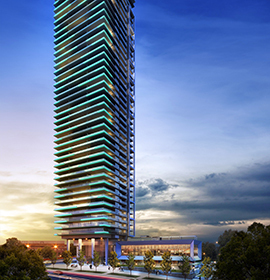 Located in one of the fastest growing neighbourhoods of Burnaby, Triomphe forms an architectural gateway to the vibrant and growing Brentwood community. Designed by Chris Dikeakos Architects, Triomphe will be rising up to 47 storeys. The homes are also fabulously designed by Mitchell Freeland Design. Triomphe will also have an extensive amenity package which will include an outdoor pool and hot tub.